Please note this blog was originally posted on the BMC Blog Network on 22 August 2018. Every year 17.7 million people die from cardiovascular disease (CVD), making it the leading global cause of mortality. Its onset is thought to be influenced not only by genetic factors and age-associated changes but also by a variety of lifestyle behaviors, including smoking, physical activity and diet. The impact of alcohol consumption on CVD risk remains a topic of debate, even controversy. It has been theorized that lower levels of alcohol intake could have a cardioprotective effect, such that moderate drinkers may be less at risk of some forms of CVD compared to heavy drinkers and non-drinkers. However, research evidence supporting this effect has been met with criticism, including the over-reliance on short-term intake measures and failure to capture how drinking behaviors change over time. The Alcohol Lifecourse Project, which has been jointly funded by the UK Medical Research Council, Alcohol Research UK and the European Research Council, was established at University College London in 2013 to specifically tackle this issue. Our aims on this project have been to examine the relationship between alcohol intake trajectories and risk of CVD endpoints using a life-course perspective, to explore potential pathways underpinning this relationship, and to help improve the methodology used in this area. In an early study, we brought together data from nine British cohorts to illustrate the dynamic nature of alcohol intake across the life-course. This work informed our next set of studies in which we examined the relationship between alcohol intake trajectories and different markers of cardiovascular functioning, such as atherosclerotic thickening and inflammatory markers. These markers are informative proxy measures for CVD outcomes, but also help us learn about the potential pathways by which alcohol intake could play a role in the onset of such disease. In these investigations, we attempted to capture both the level of alcohol being consumed by participants and the stability of these levels over time. For example, in a study of arterial stiffening, which is known to increase the risk of both cardiovascular morbidity and mortality, we found that men who consistently drank heavily had significantly stiffer arteries than consistently moderate drinkers by early old age. We also observed that male former drinkers subsequently experienced faster stiffening than other drinker types during the five years that followed. On the topic of methodology, we have explored issues such as the agreement between retrospective and prospective measures of alcohol intake and the stability of baseline-defined categories of drinking across the adult life-course. We have shown that particular caution is required in assessing heavier drinkers, as they tended to be less accurate at recalling their prior drinking and to have less stable alcohol intake trajectories. Conversely, people who drank at lower levels or abstained from drinking tended to be more accurate in their later recall, potentially due to the fact they also had more consistent levels of alcohol intake over time. We have also demonstrated the impact of wider contextual issues on assessments of how drinking may affect our health and why it is important to revise our use of previously collected data when new information comes to light. For example, in another study we illustrated how taking into account the increasing levels of alcohol content in wine servings over the past two decades can lower the mortality risk estimates observed with heavier drinkers, although very heavy drinkers remain at significantly greater risk compared to moderate drinkers. Our latest study, published in BMC Medicine, represents a culmination of this earlier work. Where previously we looked at markers associated with CVD, this new study looks at CVD outcomes directly. We used data sourced from and harmonized across six British and French cohorts to examine how ten-year long trajectories of alcohol intake are associated with risk of coronary heart disease (CHD), the most common cause of CVD mortality. Our study shows how inconsistently moderate drinkers, former drinkers and non-drinkers each have greater risk of developing CHD compared to consistently moderate drinkers. Former drinkers are also shown to be at particular risk of CHD mortality. These new findings, in combination with our earlier work, help demonstrate how trajectories of drinking across the life-course may be linked to CVD onset, and illustrate how long-term stability of alcohol intake levels is a pertinent consideration both for cardiovascular risk assessments and related health education efforts. Distinct frameworks and intervention strategies may be required to understand and address the increased CVD risk we have observed amongst different drinker types. The next steps of this project will involve explorations of the relevance of additional biomarkers and of the impact that alcohol intake patterns such as episodic heavy drinking (often referred to as “binge drinking”) have on our cardiovascular health. We are also expanding our focus to explore the relationship of alcohol consumption trajectories with other health outcomes, such as cancers and liver disease. 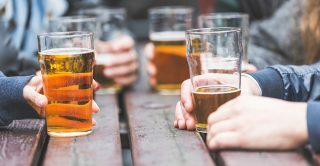 We hope that this broadened focus will contribute to building a fuller understanding of our lifetime drinking habits and the role they play in our health and wellbeing.